"[The Children of the Keweenaw] also , I think, demonstrates the enduring power of opera to connect with great stories." William Ivey, former chairman of the National Endowment for the Arts, after attending the premiere, in an interview with Tamar Charney, Michigan Public Radio. The Children of the Keweenaw, an opera with music by Paul Seitz, libretto by Kathleen Masterson, explores the human impact of a single, unexpected, tragic event -- specifically, the "Italian Hall disaster" of 1913, chronicled in newspapers and newsreels around the world and in Woody Guthrie's famous song. 74 people, 60 of whom were children and young adults, died in a stampede during a Christmas Eve party for the families affiliated with the Western Federation of Miners (WFM) who were striking against the Lake Superior copper mining companies. Many accounts of survivors describe a man, or men, who cried "Fire!," causing the stampede. But other stories survive as well, describing everything from explicit murder of children by "deputies," to a simple linguistic misunderstanding leading to a terrible accident. Neither a formal inquiry by the U.S. Congress nor a local coroner's inquest were able to arrive at a single clear account of what happened. But as I began to talk to elderly people in the community and descendents of victims and survivors of the party, I was moved by the passion that survived as they shared their stories. And I became sure that this disaster had touched every person and every family deeply, and that the divisions of that time, among ethnic groups, religions, classes, and between labor and management, striker and scab, had prevented a complete mourning by the entire community of those who were lost. 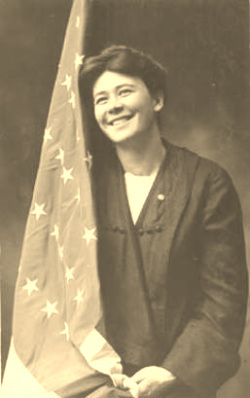 I had come to this story indirectly, after reading accounts of a young Slovenian-American woman, Annie Klobuchar Clemenc, who gained unexpected fame during the strike by leading hundreds of miners in daily strike parades throughout the summer of 1913, and local notoriety through her affair with a Chicago journalist, Frank Shavs, who had come to Calumet, Michigan to write about the strike. Already intrigued by this information, I was stunned to learn that it had been Annie, as newly elected leader of the WFM Ladies' Auxiliary, who had suggested the Christmas Eve party -- had purchased the candy and gifts, arranged for Santa's appearance, organized the program, and presided from the stage. And the Italian Hall disaster became the central tragedy of her life. And so, our way of telling is managed by Pat, a docent historical lecturer in contemporary clothing, who introduces the opera and sums it up at its conclusion, and guides our understanding throughout. He is assisted by his "Oral History Ensemble" -- eight contemporary people who sometimes sing together to comment on the action or establish a setting, but also portray, as individuals, some of the distinct experiences of these historical events drawn from written or oral accounts found in our research. Besides the contemporary figures of Pat and the Oral History Ensemble, the opera presents several costumed historical characters: Anna Clemenc, James MacNaughton, superintendent of the most powerful mining company, journalist Frank Shavs, Anna's husband Joe Clemenc, Mother Jones, and other participants in the pickets, parades, Italian Hall party and other historical events depicted. Through this combination of contemporary interpreters and historical characters, we hope to draw upon the collective truth of public memory -- the rich combination of all the different experiences of a single event -- in understanding how the Italian Hall disaster impacted this community in ways that are still felt today. As composer, I have tried to develop a musical idiom for this opera that is flexible enough to evoke the vernacular music of the many times and places we depict, e.g., the blues-on-the-radio in a scene set in 1956 on Chicago's South Side, the Slovenian waltz in 1906 Calumet, traditional singing of the Kalevala, a ragtime dance tune, the 1913 Christmas party music, etc. Having a text of great beauty and structural sophistication, I also strove to set the text in a way that enhanced the comprehension and emotional clarity of the text, while employing the careful structural elements of the libretto as a framework for the large-scale musical structure of the opera. Commissioned by the Pine Mountain Music Festival, Hancock, Michigan, for their 2001 season, The Children of the Keweenaw, music by Paul Seitz, libretto by Kathleen Masterson is supported by a $25,000 Creation and Presentation grant from the National Endowment for the Arts, as well as by grants from the Michigan Council for the Arts and Cultural Affairs, the D&N Bank, and other public and private sources. 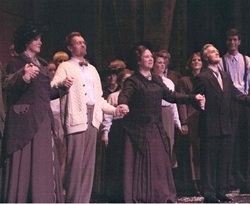 The opera was workshopped from June 25th through July 8th, 2000 in Houghton, Michigan premiered on July 11 of 2001 at the historic Calumet Theatre in Calumet, Michigan, with additional performances on July 14, 17 and 20.